As you probably know, Shoestring travel magazine has its own website by now! If you haven't done so already, please have a look at www.shoestring-magazine.com and tell me what you think! I've divided the links into different sections, to make it easier for you to find the relevant link. These sections are: Friends & Contributors, Networks, Gap Year Advice, Travel Companies, Books & Gear and Useful Info. Please let me know whether you have a website you want to see included, from professional website to your own travel blog!! I'd really appreciate your input!! A massive debate has sparked in the world of journalism in the UK: It's about the National Council for the Training of Journalists (NCTJ) and whether their examinations are really still needed, as leading colleges and universities drop the NCTJ modules from their syllabus. And rightly so. The UK is the only country to have journalists trained at university coming out with degrees that are worthless unless top-up exams (read: NCTJ preliminaries) are being sat and passed. My own degree did not provide me with full NCTJ qualification. The only exam I was allowed to sit was News Writing, and I see this as the most important exam. If you can't write at the end of a journalism degree, you chose the wrong profession. Simple as that. This should be the one exam that matters to editors... if they take somebody on who can take notes very quickly but cannot write a decent story, they simply picked the wrong employee. Law was only briefly touched upon in my B.A. (Hons) Travel Journalism degree, the title itself a bit misleading, as it was Journalism and Tourism Management, rather than Travel Writing. However, due to the title, potential employers now think that I'm not up to gathering hard-hitting news. No, editors would not be able to send me to court right away. But I do have the book, (I even dished out for McNae's instead of going for one of the cheaper ones that cover exactly the same) and these things can be learned. They do not necessarily have to be taught. Then again, where I come from, there are dedicated court reporters, and those that cover other local news. In Germany, where I come from, you don't even have to study journalism to become a journalist. In fact, a pure journalism degree is frowned upon. All you have to do is get a Bachelor's degree in a subject of your choice. This is meant to provide the journalist with insight and expertise in one topic, and also shows editors that they are determined. Once you have a Bachelor's degree, you start as a trainee and you learn on the job. There is no better way of learning than learning by doing. Work experience is the keyword here. But the NCTJ and UK editors are equally discriminating against foreign journalists who try to get a job in this country. When I tried to hand in my portfolio, my cuttings from a German daily newspaper which I work as a freelance for, were not accepted by the NCTJ. And that's after I translated it all into English. It's not the foreign journalists' fault that people in Great Britain tend to be rather ignorant when it comes to living abroad or learning another language. Just because the cuttings are in another language, doesn't mean they are not newsworthy! Besides, translating them in a way that still makes them clearly written, grammatically correct and newsworthy in English is quite a skill. Work experience abroad is meant to be a good thing. Shows that you can adapt, that you can write in a different language and that you tend to have a wider general knowledge because of your experiences. I have studied journalism in the UK for three years. I have done work experience in Ghana, South Africa, the UK and Germany. Most of it in Germany, though, because I used to spend my semester breaks in my hometown. Which means, I applied the skills learned in England to journalism in Germany and guess what? It worked just fine. The NCTJ's excuse that the systems are not compatible is a lie, and even so: Some of the best books on journalism are written in America... surely their system is different too. The one skill everyone keeps going on about is Shorthand. No other country relies on shorthand as much as the UK does. The way I see it: If you didn't learn to take notes in your own longhand or your own abbreviations during at least 16 years of education (college + at least a Bachelor's degree) then even shorthand won't help. You only need it for court. Plus, it is much easier to prove what you have written if you don't have to transcribe it first. You could show me a piece of shorthand and then tell me what it means - I won't believe you. I can't read it, the shapes don't make sense. I believe what I can see. "You need to have passed 100 words per minute". Rubbish. I have never misquoted anyone. And if they speak so fast that you would really need over 100 words per minute there's a simple solution. It's called a dictaphone! Voice recording. Even my mobile phone comes with the software. The easiest way of proving that somebody actually said it, is to play it back to them. I did an interview in 2008 with German comedian Ralf Schmitz, who is known for talking at approximately 220 words per minute. Even with shorthand, there would not have been a chance to keep up. So I took an audio recording and took down some notes to remind me of what questions I need to ask and the really important quotes. I managed to write the interview up in the way Ralf Schmitz really talks, because I had it all, word for word. Some editors I have spoken to do not have or do not use their NCTJ skills. Why do they then insist on their employees to have them? Surely they are meant to set an example?! I have survived in the world of journalism in Germany just fine without any NCTJ's. In fact, the local news editor for the daily Solinger Tageblatt asked me twice to continue working for the Tageblatt, gave me a pay rise thanks to the quality of my work (yes, in Germany, even work experience is paid!) and all that without Shorthand, PA or what they're all called. And why? Because quality of work, professionalism, a sense for news and the ability to work to a tight deadline still matter there. Let's face it: I am less likely to get a break in journalism, because the university did not provide me with NCTJ qualifications. I'll have to pay another GBP 400 just to do the course (which covers a lot of things I already learned in my GBP 9.500 degree) just to have a paper to show that I have skills that I could either learn on the job or teach myself through books. The NCTJ qualifications are overrated. A strong and diverse portfolio should be what matters. A wide range of publications and a wide range of topics covered to show that you can deal with anything that happens in your patch. If what matters most to editors are your NCTJ scores then stop doing (unpaid) work experience right now!! It might look good on your CV, but in reality, it's worthless! 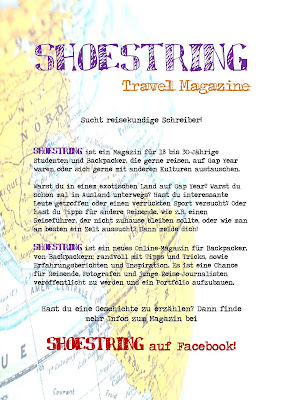 SHOESTRING Travel Magazine now has its own internet home and can be found at http://www.shoestring-magazine.com/. The website is hosted by Blogger, which means that anyone with a GoogleID (including Twitter, Yahoo, Blogger etc.) can become a follower of SHOESTRING Travel Magazine in seconds and get all the latest travel news directly to their dashboard as soon as the site is updated! 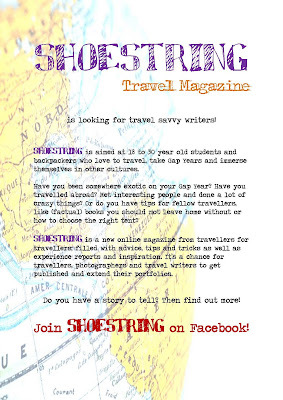 Shoestring-magazine.com has been designed to host news and reviews to keep travellers up-to-date. As the magazine is going to be published quarterly (Issue #2 is due out in October! ), news that happen between publications would not get a mention otherwise. The new site also hosts a forum called "Community" which is free to sign up to. Here, travellers and readers can share and exchange experiences and tips and maybe even find travel buddies! You can even share travel photos and videos, and who knows, maybe you'll even inspire a SHOESTRING feature or get to write for the magazine yourself! The Tips & Tricks section contains the advice pages from the magazine, such as "How do you plan a Gap Year?" This valuable advice is always accessible, and even if you can't open the link the see the full issue of SHOESTRING, as this section will conatin the pages in jpg format. This means, that for most of your travel queries, this section will become a one-stop-shop and the pages can be printed out so that you can take them away and refer to them whenever you need them. Next to all this, the website will also be where the next issue of SHOESTRING will be published! The issues will be downloadable and printable and you can bookmark and share the site on various social media platforms, including Facebook, Twitter, MySpace, Digg, Technorati and Google. The little red sign on the left of the website shows how many visitors are online at the moment, while the map on the right shows where SHOESTRING's readers are from. 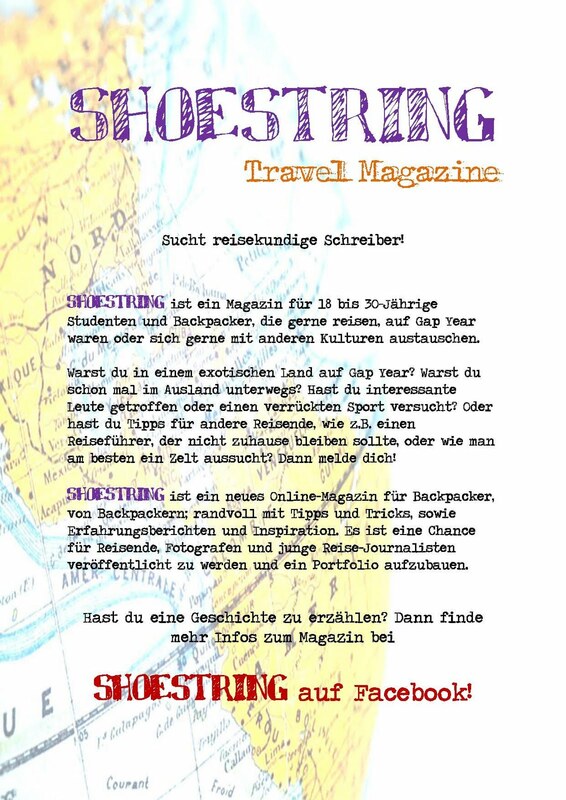 Please become a follower on shoestring-magazine.com and on Facebook (search for Group SHOESTRING Travel Magazine), and help turn SHOESTRING into an international backpacker magazine!! The idea behind Channel 4's latest travel show is simple: A British middle-class family goes around the world and tries to get well out of their comfort zone. In tonight's programme, the Willmott family travelled through India, Mongolia, Papua New Guinea and South America, in an attempt to educate the kids - two boys, aged 13 and 9, and a girl, aged 6 - all the while filming their adventures. Mother Raffia, a bhuddist, does not believe in conventional medicine, and puts her family at risk when they depart for the jungle without any of the recommended vaccinations or malaria prophylaxes and only homeopathic remedies in their bags. Although the family stays with host families in remote parts of India to interact with the locals, My Family's Crazy Gap Year soon turns into a dangerous ego trip when Raffia decides that she just has to meet the Dalai Lama. Head over heels, two cars are organised to drive them 200 miles into the Himalayas to get a chance of meeting His Holiness. On treacherous mountain roads, one of the cars looses grip and rolls twice, with the kids in the back. The Willmott's finally meet the Dalai Lama, and the kids summarise the experience with the words "It wasn't that important to me." Somehow, the family then ends up on the Mongolian plain (how exactly they got there is any viewer's guess), staying with Nomads in gers (yurts). Within hours, they have to help herd yaks, horses and sheep, and look on as their breakfast is slaughtered before their eyes. While the father of the family has to pitch in, mum looks away in disgust although she claims that they had told the kids "where their food comes from." Only the boys seem to be getting really into it, tucking into breakfast without problems and they even herd the yaks by themselves at the end of the stay. For some reason, the family then backtracks to the Mount Everest basecamp, before ending up in the jungle of Papua New Guinea. Here, the family seeks out a remote tribe that has never met a Western family before. Next to abandoned huts, the family and their guide set up camp, just to be surrounded by tribesmen armed with bows and arrows as soon as they are finished. Although they are then invited to join the tribe, and the kids definitely seem to be making good friends, the one constant in this episode is the lack of communication between the family and their hosts, most of which do not speak any English at all. But the family only seems to pick up a few words in their hosts' languages throughout the programme. Unfortunately, the viewers only get glimpses of the Willmott family gap year. Huge parts are skipped or only explained with one sentence and one picture, which leaves the viewers wondering: "What happened and how did they get there?" And the whole issue about travel health and homeopathic is not touched again throughout the programme - without medication or vaccinations, I doubt that the entire family managed to travel around the world for a year without any illnesses whatsoever. The immersion idea is a good one. It definitely takes them all out of their comfort zones and into the unknown, where they have to live like the locals and work like the locals. The children learn not to take things like running water and flushing toilets for granted, and even try insects as snacks offered by the Papuan tribe. Children should learn about these things first hand, make new friends in faraway places, hear different languages, eat different food. The more they learn, the more tolerant towards other people and cultures they will become. Channel 4's show has left some questions unanswered, though. What kind of luggage did this family take with them? Suitcases or backpacks? When did they get the idea of going around the world and how much planning has gone into it? How much did it cost? Where did they get fitting local dresses upon arrival from? How did they pick the places, and, most of all: how did they arrange all these host family stays? It's a good show, if you are interested in one family's travels, or want to see middle-class Brits getting back to nature. But from experience, I can only say that meeting the Dalai Lama and living with a remote tribe in Papua New Guinea are not your average Gap Year experiences, nor do these exploits, as down to earth as they might be, sound like they were planned on a budget. My Family's Crazy Gap Year, Mondays 9pm, Channel 4. Yep, folks, this is where I work on this blog and try to create Shoestring Travel Magazine! Just out of shot is the printer and my old laptop which has the publishing software on it (the version I have only runs on XP...). But that's about it! I'm hoping to expand my work space a little when we move house, probably in a few months, get a proper desk to spread stuff out on and get the rest of my books sent over from Germany... The books I've got here are only journalism related. All the travel books, guidebooks, wildlife books, Almanachs are still at home. Oh, and my souvenirs! They're still in Germany too! One day, I want to be able to have shelves stacked with topical travel books, have my world map with pins of where I've been back up on the wall and souvenirs dotted everywhere. A proper travel writer's work space, if you like. I know that won't happen for a while yet, though. Help spread the Shoestring word! 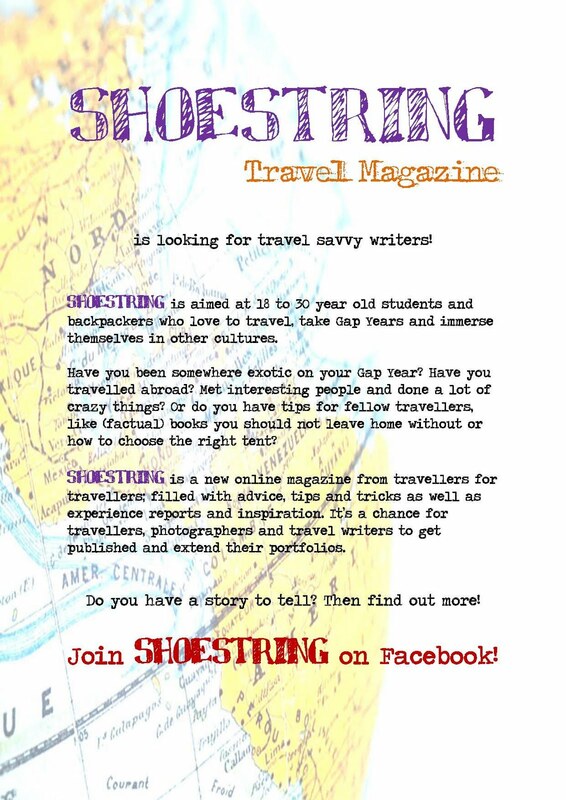 As you might know, I'm busy planning my travel magazine Shoestring, and I am still looking for contributors. I have designed for Shoestring and would really appreciate it if you could print them and distribute them around university notice boards, halls, student bars or community centres. One of the flyers is in English (below), the other is in German (above). Although the magazine is based in the UK (due to me living here), the authors can come from around the world and talk about every country on earth. I'd really appreciate your help in getting the word about Shoestring out! Drinks with the team at the Lady of Mann pub in Liverpool, after the contract working for easyJet's German customer service at Arvato Services came to an end today. It's been great working with you guys, and, after 3 years I really enjoyed being able to speak German in England! Keep in touch!